As mentioned many times on this blog – I truly enjoy the simplicity of casual items. Sometimes, I wear casual items from head to toe. Other times, I like to mix them with dressier pieces. Casual/basic pieces are the foundation of my wardrobe and I tend to lean towards them more as I get older. I still find myself attracted to certain fashion trends such as faux fur, peplum, leather pants…but often times, they don’t really suit my lifestyle. I have always loved trends and I still do. However, I always think twice about spending my money on trendy pieces. There is no secret that I love watches. I always wear a watch and feel naked without one. I have worn my Michael Kors one countless times on this blog. Thanks to Daniel Wellington for sending over this beautiful watch. It compliments my outfit pretty well. If this red/white/blue band isn’t your style, there are many different bands to choose from. 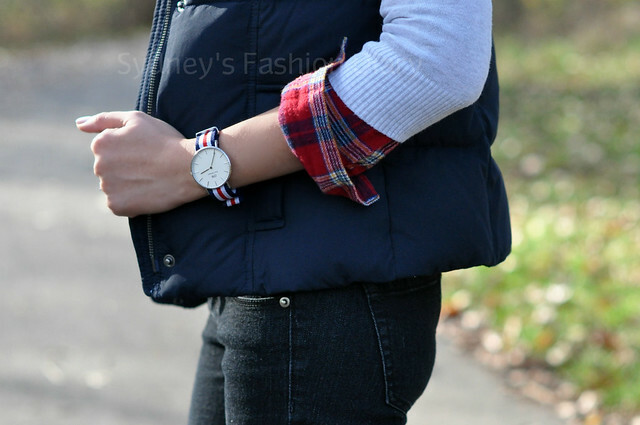 Daniel Wellington is generously offered a discount code for readers of Sydney’s Fashion Diary. Enter code “SYDNEY” at check out and get 15% off your purchase. Love this casual outfit, such cute layering! You look so pretty! Very cool and casual. Awesome boots and cool sunglasses! The outfit as a whole is awesome as well. I love this outfit and how you have layered the check shirt. Love your layering here, you look gorgeous! Love the layering here and also your hair! Is it naturally this straight or you straighten it? This cool 'n' casual look is so fab, Sydney and love how you layered it! Love the layering, plaid and vest. This is a very cute look for a casual outfit and yeah that watch def matched this outfit. Your hair is getting so long!!! Love your casual yet chic outfit! you look wonderful - the layers here are perfect. just perfect.